I don’t know if it’s possible for a fruit or vegetable to be a part of the zeitgeist but if so then I think it’s safe to say that Avocado is having a bit of a moment. An ingredient once reserved solely to make up the green part of a tricolore salad has now become the grenade of the wellness warrior, appearing in many a green smoothie, salad and sometimes even the odd dessert too. I must admit that I have succumbed to the trend and you can often find me chomping away on a mixture of mashed avocado, lemon juice, salt and chilli flakes generously slathered on a couple of ryvitas. A recipe that seems to be popping up all over the blogosphere is Avocado Houmous so I thought I’d give it a whirl. See below for instructions on how to make my version as well as some quick and easy spelt flatbreads. Makes one large bowl and 4 flatbreads. 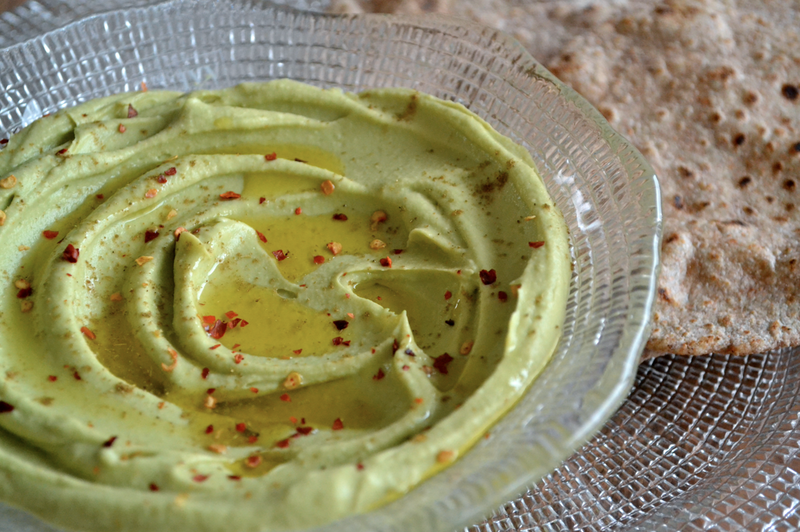 AVOCADO HOUMOUS // Start by whizzing up your chickpeas in a food processor until powdery and deconstructed. Add all the remaining ingredients apart from the water and whizz until pureed. While the machine’s still running, slowly start to add the water – the amount you’ll need depends on the consistency you are looking for so play around until you’re happy with the texture. 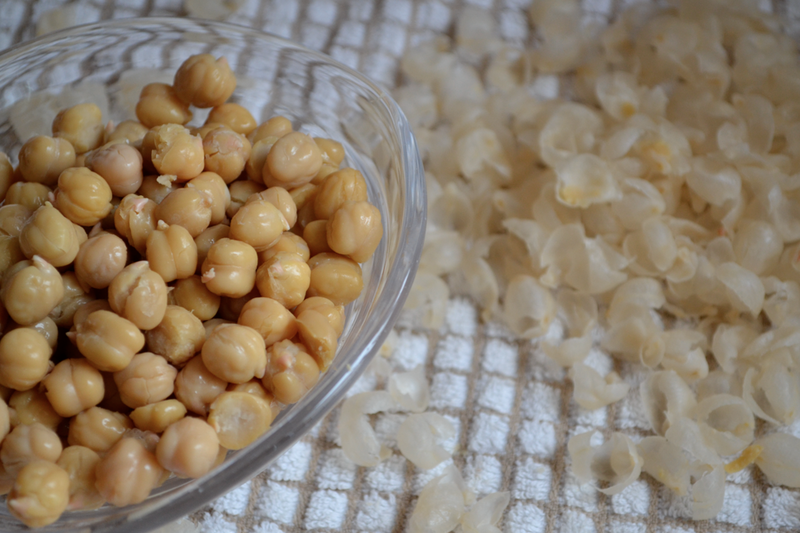 As an optional extra step, If you have more time/are slightly barmy like me you could always peel the skin of the chickpeas – a little tip I picked up from smittenkitchen.com – this makes for really super smooth and creamy houmous. 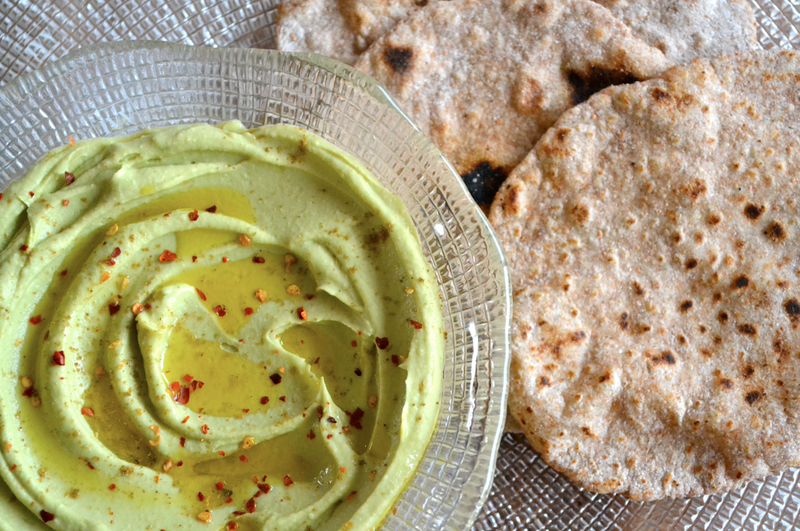 SPELT FLATBREADS // Simply put all the ingredients in a large bowl and work into a dough with your hands. Cover and leave to rest for around 15min. Next, split the dough into four equal pieces and roll each out – on a floured surface – into 2-3mm thick rounds. Warm up a pan over a medium-high heat. Lay your flatbread in the hot pan (I had to do this one at a time) and when it’s slightly puffed up and the underneath is starting to blister flip it over for another minute or so on the other side. They are at their best when served warm. S-O-T-H TIP: To serve, drizzle with extra virgin olive oil and chilli flakes.